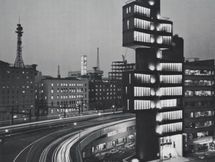 Kenzo Tange further developed his ideas for expandable urban forms in 1966 when he designed the Yamanashi Broadcasting and Press Centre in Kōfu. It was designed for three media companies: a newspaper printing plant, a radio station and a television studio. To allow for future expansion Tange grouped the similar functions of three offices together in three zones. The newspaper printing machinery was on the ground floor, sealed studios on the upper floors and offices on glass walled floors surrounded by balconies. The services, including stairs and lifts, are housed in 16 reinforced concrete columns that are of five-metre diameter. 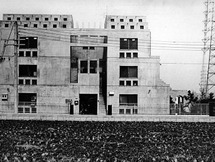 Space was left between the cluster of functional space to allow for future expansion, although these have been used for gardens and terraces.